Millions of sports fans experienced the thrill of a lifetime when the Chicago Cubs captured the 2016 World Series crown after a title void of 108 years. For collectors looking for a unique way to remember this event and keep those amazing memories close to heart, sports art can be an enriching way to relive the joy. W. Lopa Studios is offering limited edition, hand-signed, hand-numbered and embellished prints of a custom celebratory painting created to commemorate the historic event. Congratulations to the 2016 Chicago Cubs World Series champs! Here is your chance to own the beautiful 2016 Chicago Cubs artwork, shown above, by artist Bill Lopa. 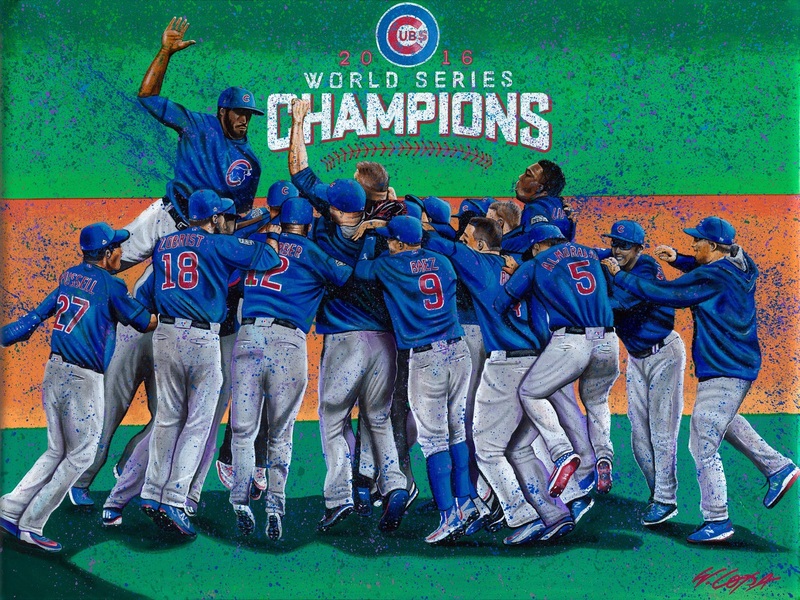 W. Lopa Studios will be offering two different limited edition, giclée on canvas prints of the Cubs celebration artwork. The first edition is limited to 108 hand-created canvas copies (artist recreation on canvas). This version is a 30 x 40 inch, fine art giclée on canvas which is hand-signed, hand-numbered, and hand-embellished for approximately 30 minutes by artist Bill Lopa. The second edition is a smaller size of 16 x 20" and is also a fine art giclée on canvas that is hand-signed and hand-numbered to 200 pieces by Lopa. We are offering a 50% HOLIDAY DISCOUNT on either edition while this offer lasts. To receive this artwork for yourself or a holiday gift, all orders must made no later than December 21, 2016. For more information and to place an order, please call 917-515-1208, and ask for Joe. You can also email directly at lopasportsart@aol.com. At age five, Bill Lopa segued from mastering his coloring books to bi-weekly art classes at the Nutley Art Academy, where he credits his instructors with educating him about structure, form, and depth perception. Montclair Art Academy followed, and Lopa earned a Bachelor of Fine Arts degree from William Paterson University in Wayne, New Jersey. From age 15 on, art has been his life. Friends, family and neighbors commissioned work from him, and his distinct impressionist style quickly caught on in what can be called a grassroots fashion. These same fans would later take Lopa's works of art and have them placed in galleries, consigned to art dealers and even sold to individuals/consumers up and down the East Coast. Lopa's artwork has been featured in art galleries across the country, including the Markman Galleries in Las Vegas, Gallery Four at the Garden State Art Plaza, Field of Dreams (multiple locations), ArtExpo in New York, Just Ducky in Chicago and in several Hall of Fame memorabilia franchise stores. Since it’s been a year, you would need to check using the email or phone number listed in the article.